With the goal of releasing an update every 6-8 weeks, I'm happy to share that the latest game update, 0.9.2 is now live on PC! Please note that this update is not available on PS4 - read more about that here. There are three big-ticket features included with the 0.9.2 game update: a new tutorial, new music, and a messages menu. We've also fixed a bunch of bugs, made improvements to animations, and added some new stuff to explore on Sialia. A full list of changes can be found in the Release Notes. Welcome to Tyro Valley, the home of SNOW's new tutorial! 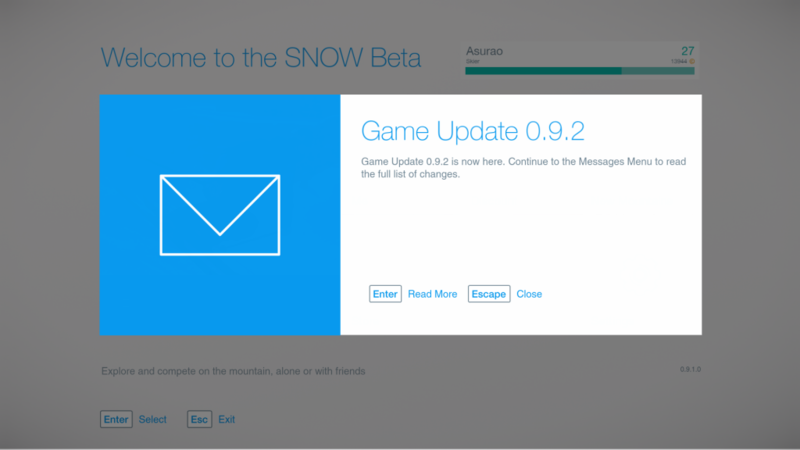 The new tutorial brings a much needed improvement to SNOW's user experience. When you boot the game for the first time you will automatically be loaded into Tyro Valley, a brand new mountain that contains the tutorial. Players are now required to complete the tutorial and as a reward unlock the rest of the mountain's drop points. But don't worry, the tutorial is quick and painless - it teaches you the basics of riding and performing tricks, and is much easier to complete than our previous tutorial. We've given you a lot more time to get used to the controls and more flexibility to decide if you want to move onto each next lesson. Tyro Valley will have more content added to it in the future as it becomes and more 'entry level' mountain for new players. For now though you can ride the various tutorial piste courses and explore the forests around the valley. To stay better connected with our users we have added a way to message players in the game. We can now post messages as pop-ups in the Main Menu, or add longer messages to the Messages Menu located in the Me Menu. Next time you start the game you should see a message pop up in the Main Menu alerting you about this new update. You'll also be able to view the full release notes for the update in the Messages Menu. We hope you enjoy this update. We are already working on the next update, which will be much more substantial and include even more great features and content. Stay tuned for more information coming soon.